Views - Is South African Listed Property attractive? This article forms part of Sharenet’s MARKET OUTLOOK 2019 series and should be read in context and as part of a diversification strategy for your wealth and investments. How would you invest in real estate? Historically, the only way individual investors could get exposure to the property market was through a direct investment, such as purchasing a house or flat. While owning a tangible asset has its benefits, it comes with several drawbacks. These drawbacks often include: an initial large capital outflow, bond repayments, maintenance costs, and the sourcing, vetting and management of tenants. Many investors have also experienced first-hand how difficult it can be to realise the money from a property when markets are depressed. This can be very important if you suddenly need money due to an emergency or a very attractive business opportunity. In contrast to this, listed property funds allow investors easy access to their money, plus the same cash flow benefits of owning property, without the drawbacks incurred when legally owning property directly. It is also possible to make small and even regular investments in listed property, no minimum size. Additionally, listed property offers risk management though well-diversified property pools whereas direct property investments are often dependent upon the relative success of a few owned properties. A real estate investment trust (REIT) is very similar to a mutual fund, but instead of investing in a pool of equities or bonds, you are investing in a pool of properties. REITs are broken up into shares, which can be bought and sold on investment platforms including various stock exchanges like the JSE. The REIT structure is therefore particularly popular amongst investors due to its easy access of liquidity, low barriers to entry, diversification between property types and geographies and its minimal admin requirement. 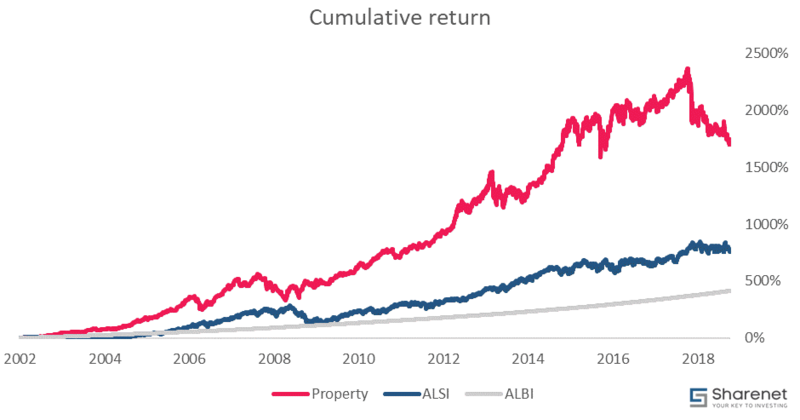 Looking at the past 15 years, the South African Listed Property Index (J253) has provided the greatest overall return when compared to the All Share Index (ALSI) and All Bond Index (ALBI) (Graph 1). The J253 can be seen as the best of both worlds: providing exposure to assets with the potential for high capital growth and income. However, due to controversy surrounding several large REIT companies at the start of 2018, the property market suffered a 25% drop over the year. Prices remained under pressure for most of the year as investor confidence was eroded. There were also other factors at play, including pessimism about economic fundamentals that pose a risk to rental income growth. Understanding the risks to property investment starts with understanding where investment performance is generated. The overall return on a property index can be broken into three constituents; capital appreciation, dividend yield, and dividend growth. Each of these constituents adds a unique benefit to investing in listed property. Capital appreciation refers to an increase in share price. For REITs, this appreciation is linked to an increase in the value of the underlying properties, and market expectations of future revenues. Similar to equity investments, market expectations of future revenue contribute the most to return volatility. Dividend yield is the dividend per share divided by the share price. The higher the dividend and the more consistent the growth in the dividend, the higher the share price should be. REITs are required to distribute 75% of their taxable earnings as dividends, meaning that as long as the company’s income remains stable, so should the dividend pay-out. While dividends paid has remained relatively stable, the dividend yield has fluctuated with REIT prices, declining from 16% in the early 2000s to 6% in 2017. During the 2018 sell-off, yields soared to 9%, and in December briefly matched the 10-year government bond yield. Dividend growth refers to the increase in dividends paid out per share. While the growth of dividends in the property sector has been consistently higher than inflation, it has lagged behind the average ALSI dividend growth rate. Risks within the property sector can be split between internal and external factors. Internal factors relate to company-specific risks like large debt on the balance sheet or accounting irregularities similar to what we saw with the Resilient scandal. As 75% of their income must be distributed as dividends, REITs must make use of debt or equity to finance further acquisitions. In times of economic hardship, debt may become more difficult to repay as revenue generation comes under pressure. However, regulation does require REITs to have a maximum debt balance of 60% of gross asset value. The outcome of the investigation into the Resilient group is still uncertain, as investors wait on the Financial Sector Conduct Authority to release results. The majority of the impact of the risk from these allegations has most likely already been priced in, but the overhang remains and who knows what else gets unearthed from the investigation. Hopefully, transparency and trust returns to the listed property sector once the investigation is concluded. At current prices with attractive yield, investors can afford to wait for confidence to return to the sector and potentially get in early into a sector that should rebound strongly. External factors should continue to influence the sector, including the uncertainty surrounding the 2019 election, government policies on land rights, global economic performance, as well as Brexit (and its impact on UK property valuations). President Ramaphosa has indicated he is working towards improving investor confidence in South Africa and promised complete transparency on the process to amend property rights. At the start of 2018, the Resilient group and related companies, including Nepi Rockcastle, Fortress, and Greenbay, were accused of artificially inflating the prices of their properties and malicious accounting practices. There was smoke and unsurprisingly it was a fire causing it. The share prices of these companies fell on average 60% within three months. Over that same period, the rest of the property sector gained 5% with investors switching out of specific companies. It wasn’t long before investors started abandoning property altogether and the sector fell 25% over the course of the year as the bad press caused investor anxiety. The negative impact of the allegations was severe as the four companies accounted for almost 40% of the total market share of the listed property sector, amounting to approximately R800 billion. The loss of trust, decreased business confidence, and poor economic growth put the rest of the sector under increased scrutiny. Despite property’s recent tumble, it still retains the best risk-adjusted return, as measured by the Sharpe ratio. 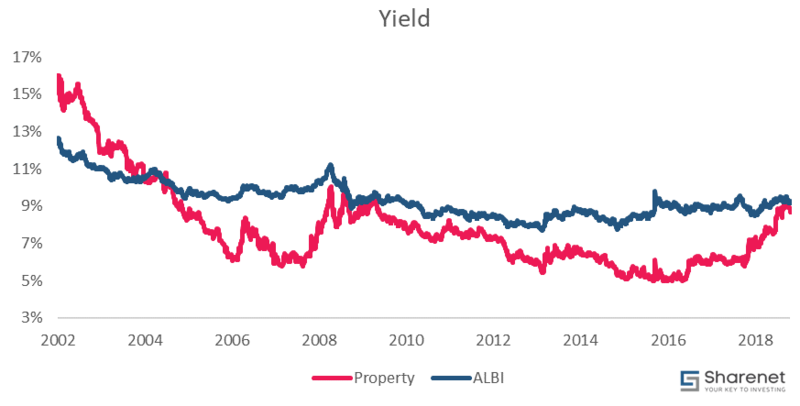 We are of the opinion that the fall in 2018 brought property shares back to affordable levels, with current yields on the SAPY averaging 8.6%. As discussed in our recent article, MARKET OUTLOOK 2019 it is our view that the outlook for the property market is generally positive, with larger industry players diversified across multiple regions for improved income stability. Intelligent acquisitions of properties abroad have assisted with revenue generation, and should continue to do so in the future. Looking beyond the 2019 local election, global factors such as Brexit, the ongoing trade war and certain struggling emerging market participants are likely to have a negative impact on all asset classes across markets. Thus, it is essential to lock in attractive yields while they are still at affordable levels. Income funds have been the top performers over the past year, but investment in listed property provides a competitive yield, while still allowing for the possibility of capital appreciation. Property is currently the most affordable it has been in over a decade and appears poised for a comeback. Buying now could deliver a high yield, providing attractive income in these uncertain times. As highlighted by the recent focus on company transparency, choosing quality companies with credible practices is vitally important. The Sharenet BCI property fund invests in REITs with proven track records and has made good investments abroad as well, including investing in the likes of Growthpoint and Redefine Properties. These funds also have low leveraged positions, providing an increased safety moving forward. We know Investing can be daunting at times and we are also aware you may not be comfortable asking the necessary questions in open forum or during seminars, so we would like to invite our investors and clients to ask these important questions by contacting us on the following e-mail support@sharenetinvestments.co.za or by completing your details below; a competent and friendly Sharenet Team member will be in contact within 24h for a no cost, no obligation conversation. Daniel is a Junior investment analyst and CFA candidate. He completed his undergraduate BComm Investment Management at Stellenbosch University, and his Postgraduate in Financial Analysis and Portfolio Management at UCT.